Avanti Smock is lined, but not padded, thermal layers can be added to make it suitable for cold weather conditions. Made with soft touch, low rustle brushed Polyester tricot with a Deerhunter Deertex laminate layer making them 100% waterproof, breathable and windproof. Fabric is treated with Aegis Microbe Shield, an antimicrobial technology which protects against odour, staining and deterioration. Durable 100% Brushed Polyester - hardwearing, no rustle, soft touch fabric. 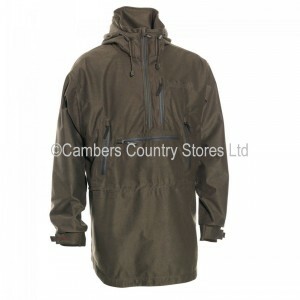 Technical Deer-Tex Performance Shell - 100% Wind waterproof and breathable membrane. Grown on hood non detachable. Adjustable cuff for comfortable fit. Breathable Polyester Lining for comfortable all day wear.